Tick tick tick tick tick… Valentine’s Day is nearly upon us, but there’s no need to panic! We’ve got you covered with romantic timepieces that will make your sweetie swoon. Frederique Constant releases a timepiece of accessible luxury with its Valentine-themed horological smartwatch. The silver colored dial sports a rim of subtle mother-of-pearl set with 8 diamonds, with a texture of hearts at the center of the dial. Though it looks like a traditional watch, a digital module inside acts as a fitness tracker, connecting via the MMT-365 app to count steps taken and hours slept, among other functions. 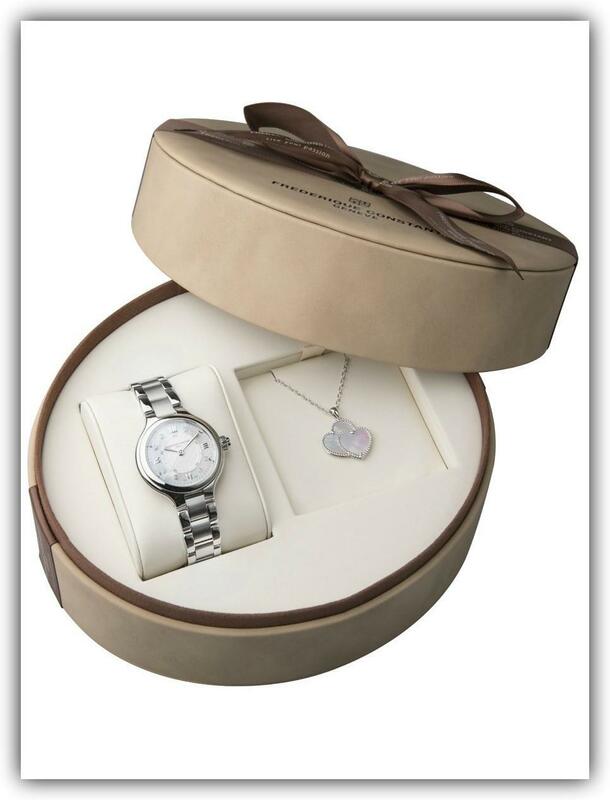 The stainless steel timepiece is delivered with a silver and mother-of-pearl pendant with a twinned heart motif. Originator of the playful, mobile “Happy Diamonds” motif, Chopard revisits the classic concept with a white gold version on a glossy red alligator skin strap. 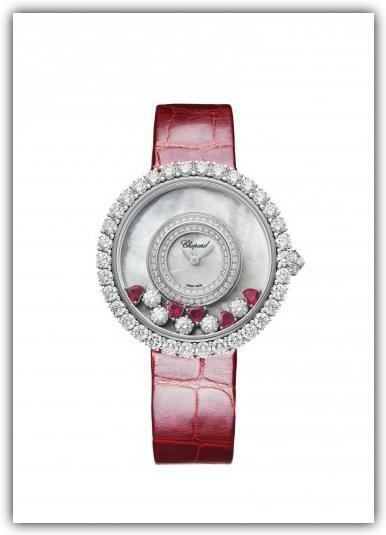 Five round-cut white diamonds are joined by five heart-shaped rubies on a mother-of-pearl dial, framed on the interior and exterior of the rim by more rows of diamonds. A quartz movement powers the piece, which is available exclusively at Chopard boutiques. With a red-hued take on the watchmaker’s La Sirène collection, Ateliers deMonaco presents an haute horology take on unfettered luxury. The movement inside is decorated by hand, including a 22-karat gold rotor engraved with the shield of the principality of Monaco. The 18-karat solid gold dial is set with three diamonds, 21 pink sapphires and 24 rubies, while the bezel echoes that shimmering, graduated color with two diamonds, 28 sapphires and 16 rubies. This ultra-exclusive timepiece is available in a limited edition of just eight pieces. 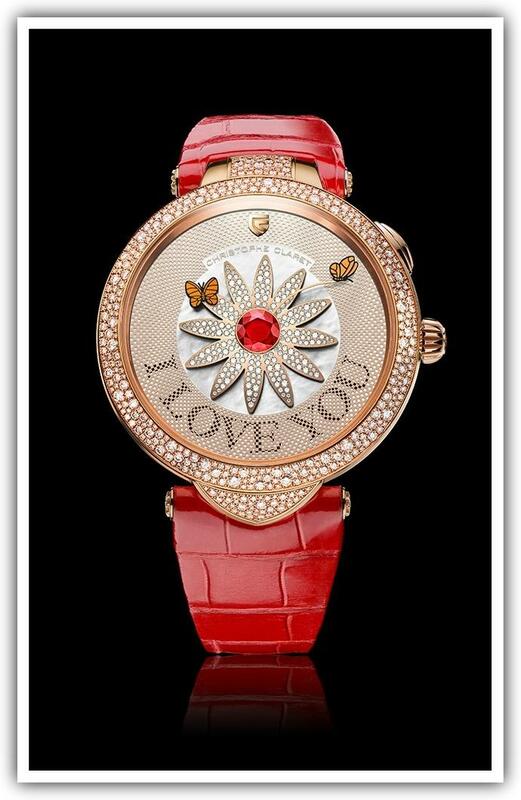 Say it with flowers… and butterflies… and a strikingly innovative timepiece that will literally spell it out for you. This trim, 36.9mm version of the Marguerite indicates the time with two butterflies flying around the eponymous central flower. Most of the time, four Arabic numerals around the dial act as markers, but with a push on the crown, they disappear to reveal a secret message for your Valentine. 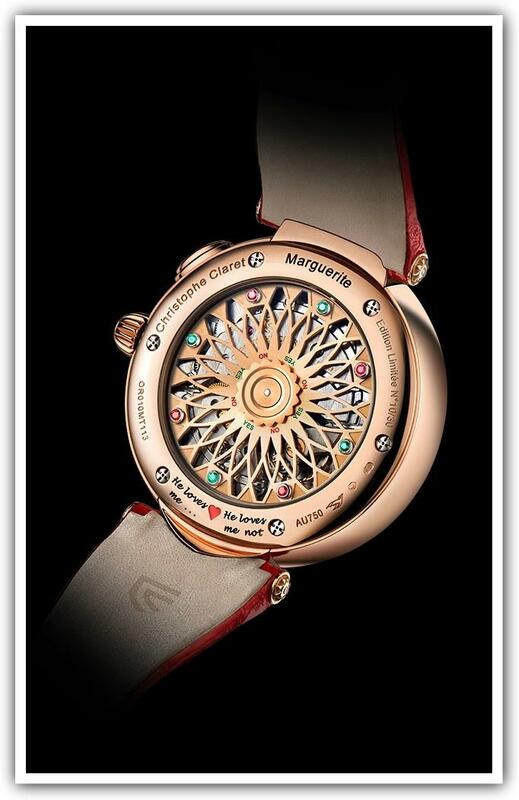 The caseback allows the wearer to play a quick game of “he loves me… he loves me not” but if he buys this watch for you… we’re pretty sure he loves you. Set with diamonds on the case and daisy petals, the Marguerite is available in a limited edition of 30 pieces.